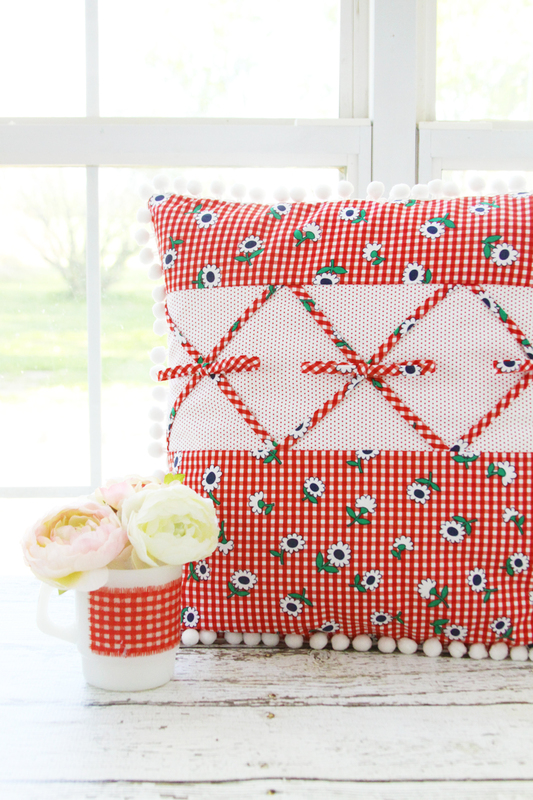 Sew up this retro gingham pillow with Sunnyside Ave Fabric and show off your love for retro gingham style! 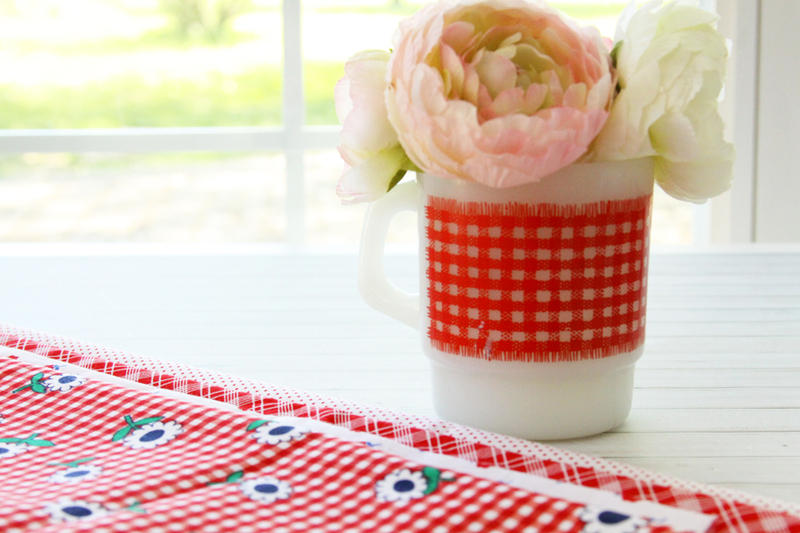 I have a deep and abiding love for all things Gingham – I think it’s so retro and fun and it never goes out of style. So of course the new fabric line from Amy at Diary of a Quilter had to come into my home to be turned into something fun. 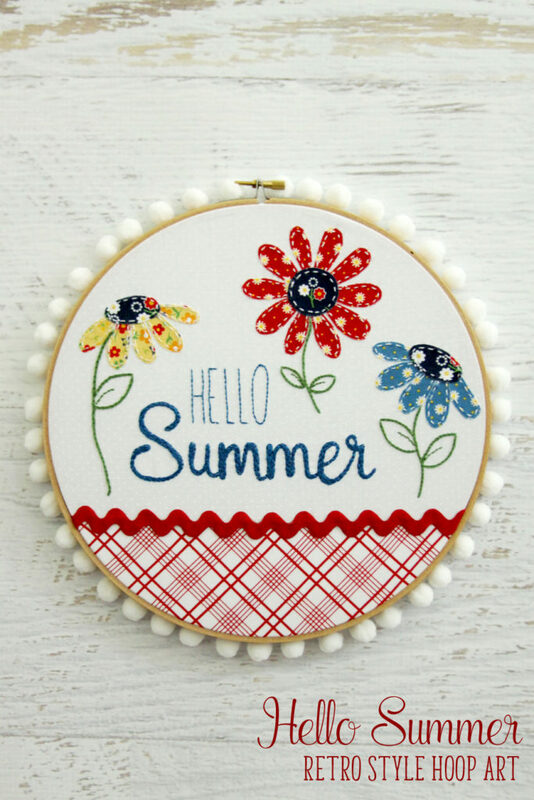 It’s called Sunnyside Ave and it’s all made up of fabulous ginghams, daisies and apples! It’s seriously retro and delicious! Isn’t it fun? All those retro prints make my heart go pitter patter. A few months ago I found a vintage gingham dress on Pinterest that had little bows criss-crossed across the front and I knew I had to recreate something similar. 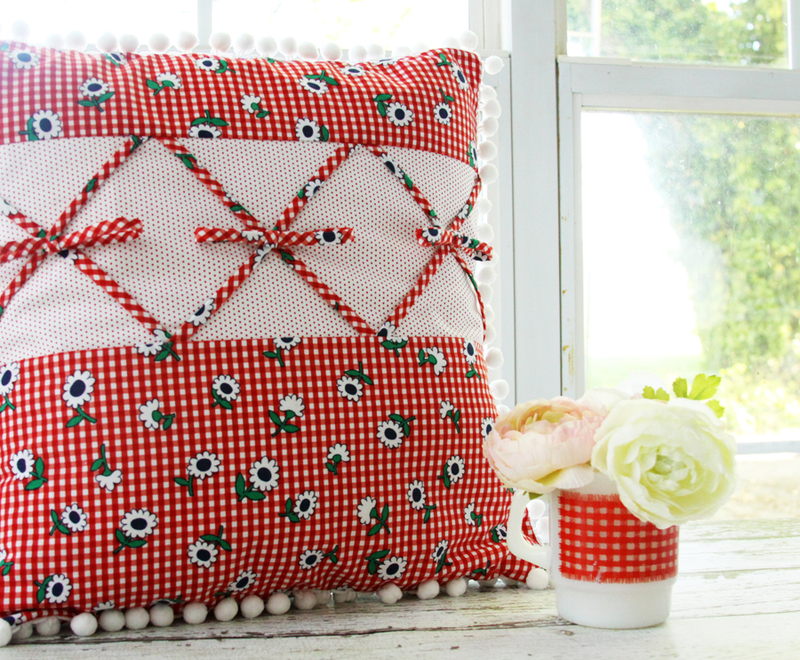 When I saw Sunnyside Ave. fabrics I knew they’d be perfect as a little criss-crossed pillow! The pillow has these little x’s across the front, decorated with little bows, and I’m kind of obsessed. Don’t be afraid of these little fabric tubes either. They are easy peasy to sew! Fold the diagonal strips in half long-wise. 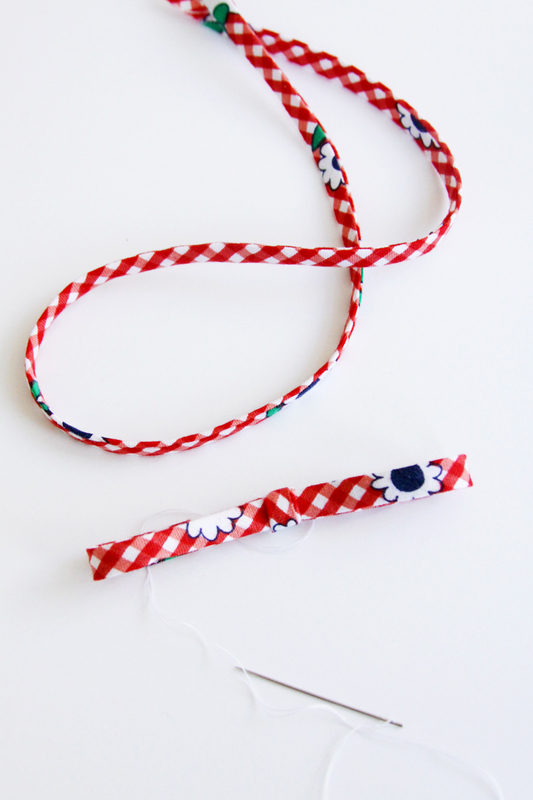 Place a length of twine in the center of the folded tube. Sew across one end to sew the twine in the center of the fabric. Sew down the fabric with a 1/8″ seam allowance. 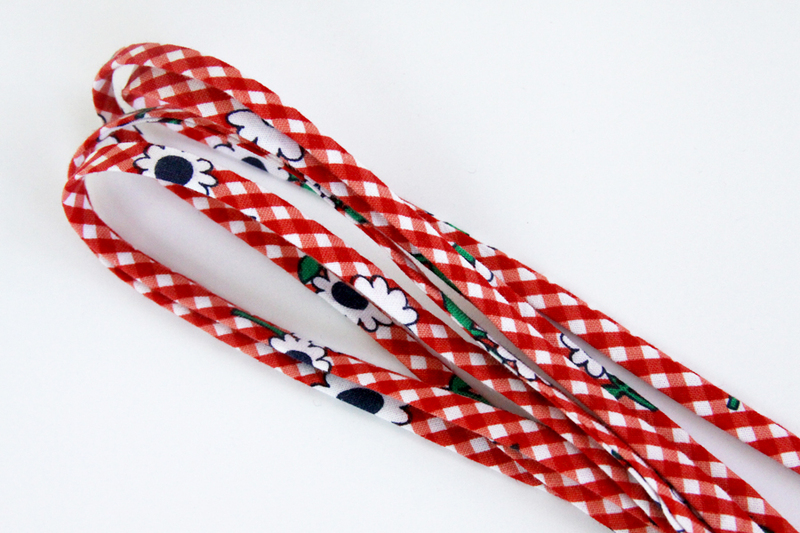 Leave a length of cording about 2″ below the end of the tube. 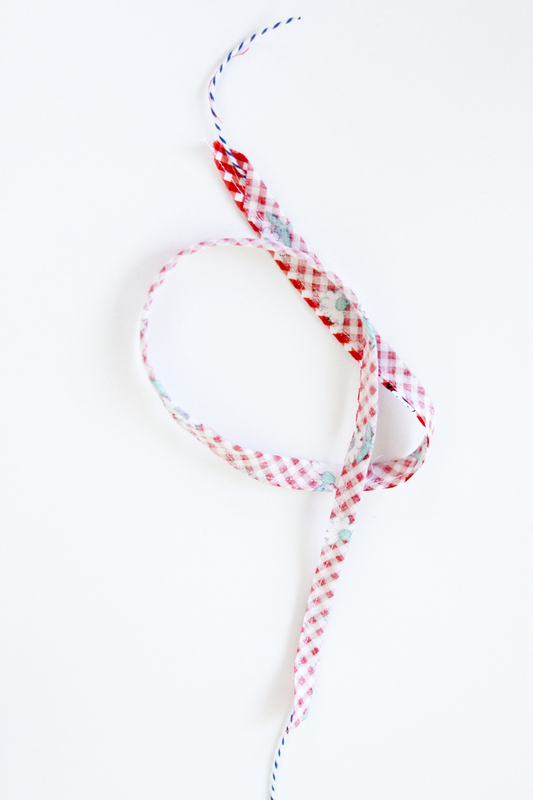 Gently pull on the end of the cording that isn’t sewn in place to turn the fabric tube right side out. Cut the cording off the fabric and press. On the Mini Dots fabric, mark the center of the fabric strip at the top and bottom. Mark the strip every 2 1/2″ along the top and bottom until you get to each end. Start laying your fabric strips in x’s across the fabric. The bottom left strip will go to the line that is 5″ from the left on the top. The top left strip will go to the mark that is 5″ to the left on the bottom. 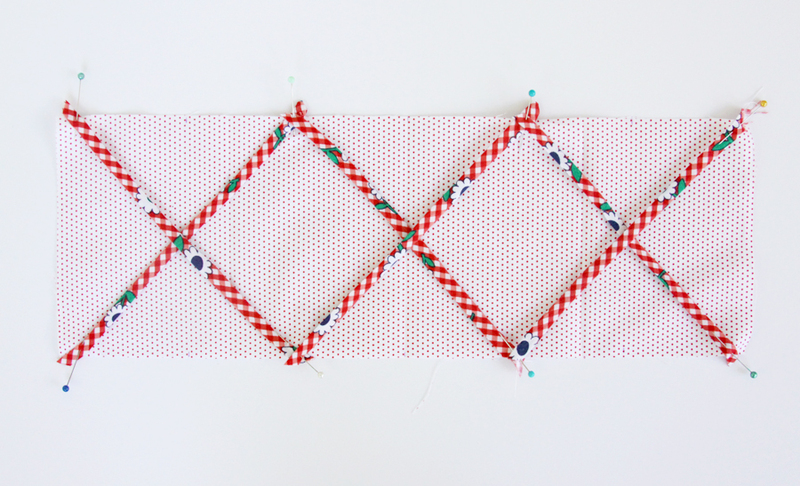 Continue crossing the strips so that you have three x’s across the dot fabric. 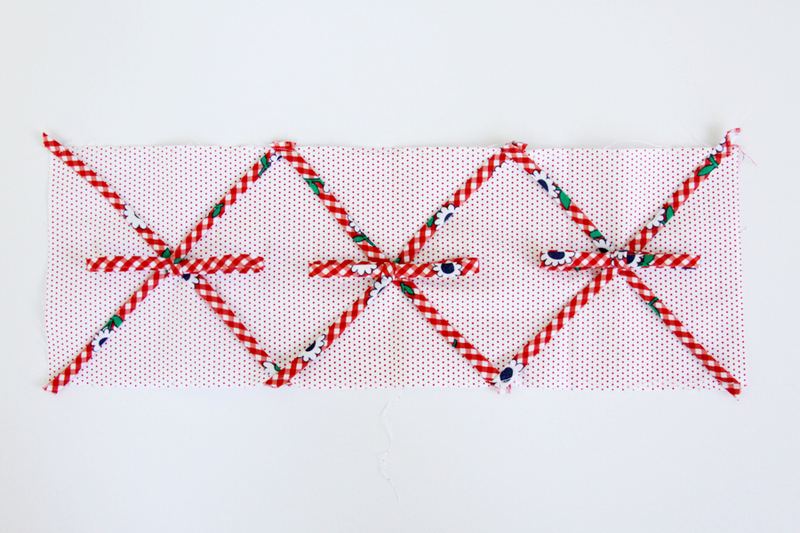 The x’s should meet in the center of each x. Pin all strips in place and sew a basting stitch 1/8″ along each long side. From the remaining strips, form three bows. Hand sew the bows to the center of each “x”. If you need to, add a little fabric adhesive on the underside of the bows and x’s. 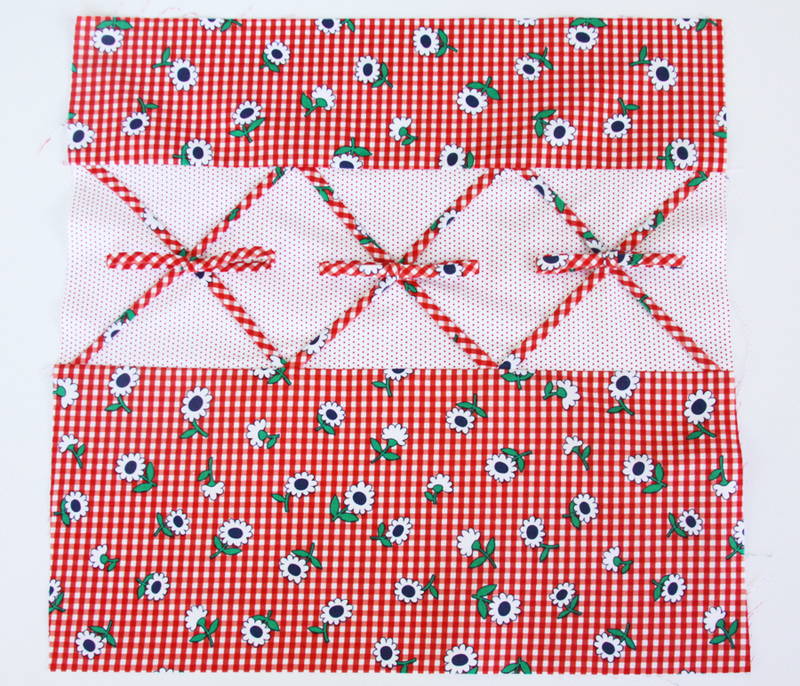 Sew the two strips of Sunnyside Main to the top and bottom of the dots strip. The 4″ strip should be on the top and the 7″ strip on the bottom. Press the seams towards the top and bottom. Form an envelope back with the Blossom white fabric. Hem the bottom of one side and the top of the other side. 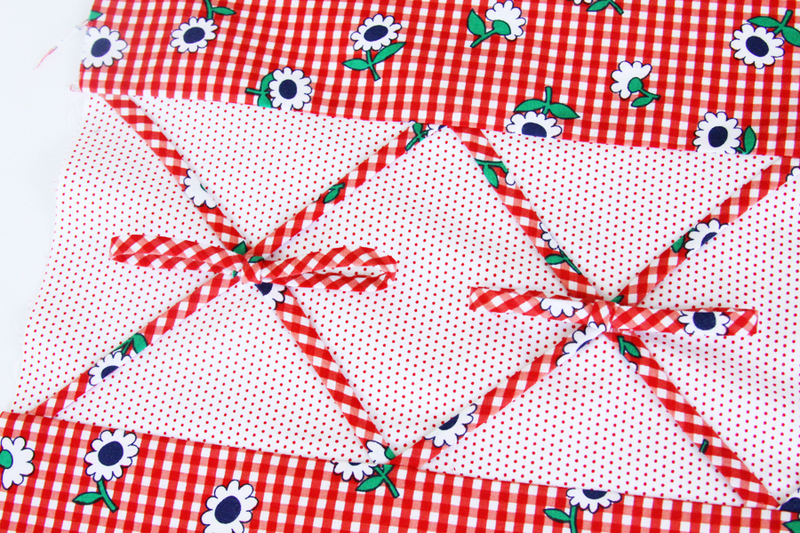 Overlap the two so they form a 16″ square, with the top piece having the hem towards the bottom. 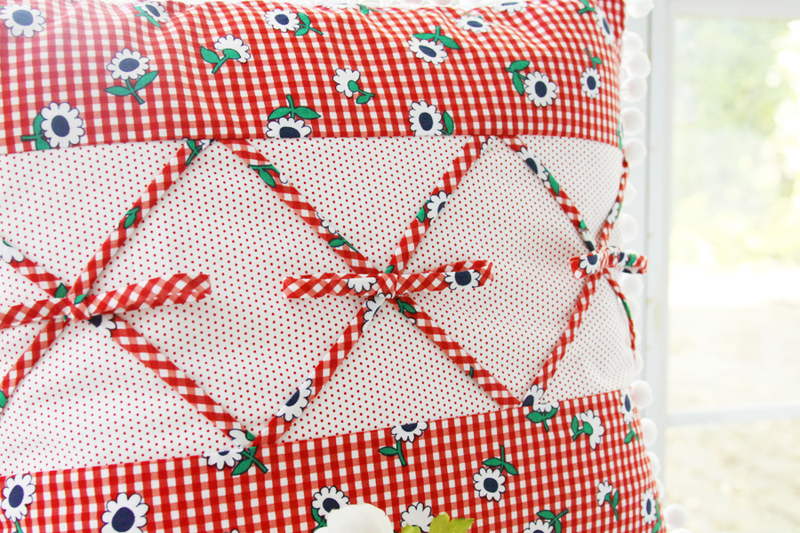 Sew the pom pom trim around the edge of the pillow front, with the balls of the trim pointing in towards the center. Place the pillow front face down on the pillow back pieces. Pin around all the sides. Sew around the entire pillow just insde the trim seam. Clip the corners and turn the pillow cover right side out. Put the pillow form in the cover and show off your new pillow! 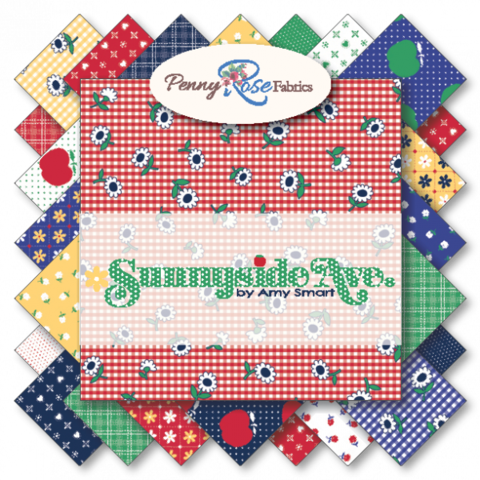 You can find more Sunnyside Ave projects and info over at Diary of a Quilter along with shops carrying the fabrics! Linking up to parties here. 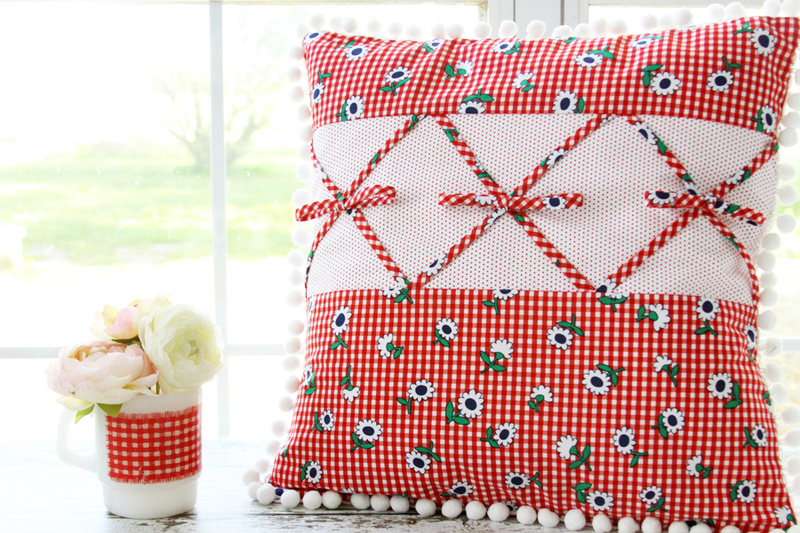 What a pretty, cheery Pillow!! Thank you for sharing the tutorial. I want to make little tubes. Oh my gosh, Bev. This is the CUTEST!!! Thank you so much! I can’t sew at all, but I love this print. Your pillow is beautiful. Thanks for sharing at Merry Monday. Hope to see you at the party next week! Love it Bev, really lovely. thanks for sharing on craft schooling Sunday! So cute, lots of work!!! Love gingham!! Be sure to stop by and share on Oh My Heartsie Girls WW this week! Such a sweet and fun pillow. 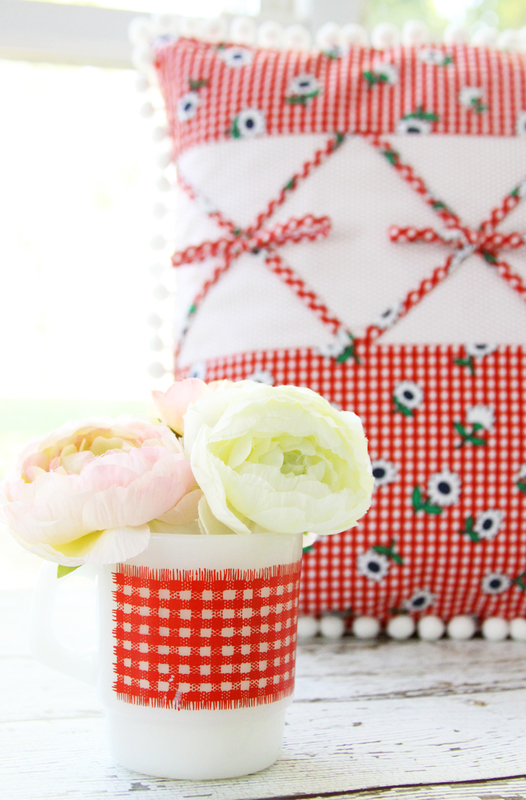 I too love gingham and if it has flowers dancing upon it…..well even better. So happy to visit your fun place from the bottom of the world. Oh my gosh, this is absolutely darling! 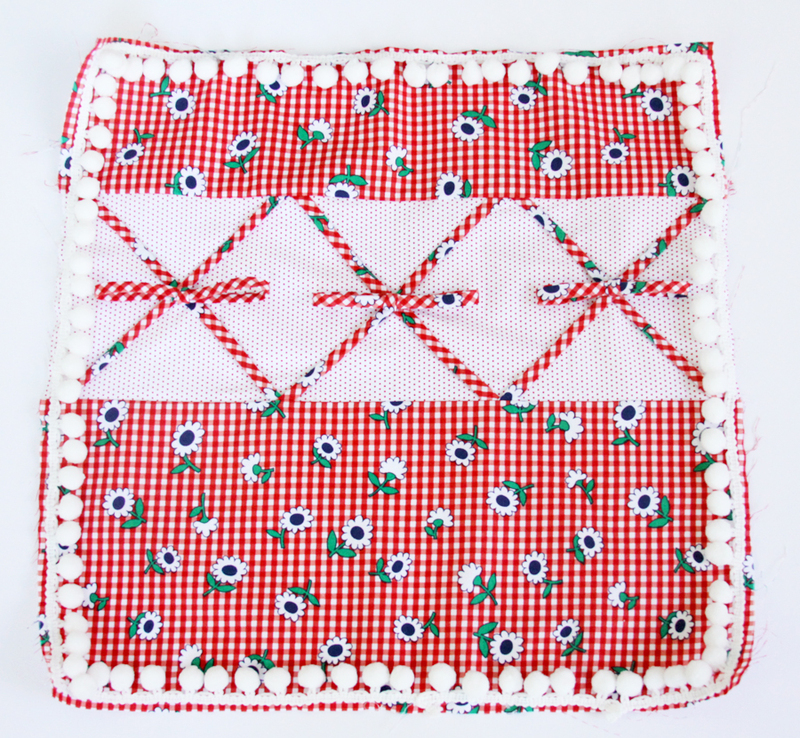 I love gingham too, and the criss cross is so unique!! Thanks for sharing with SYC. 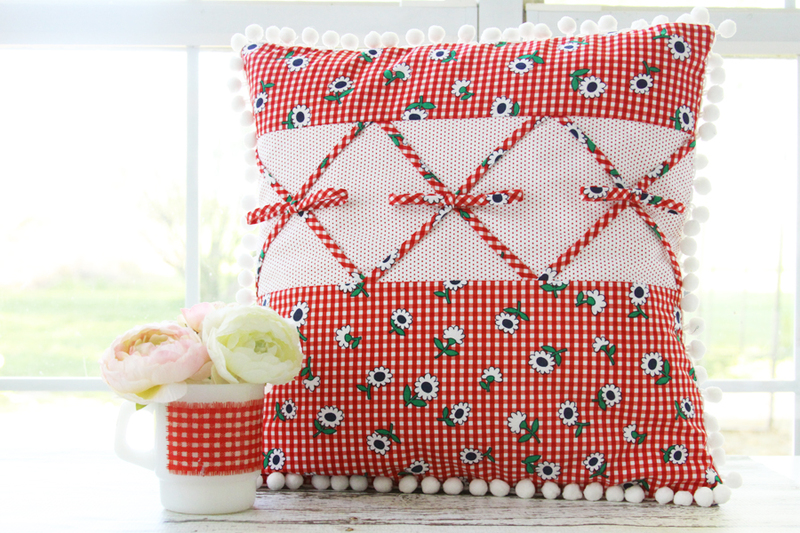 Love the fabric and retro styling of this gorgeous pillow Bev. Thank you for sharing at Create, Bake, Grow & Gather this week. 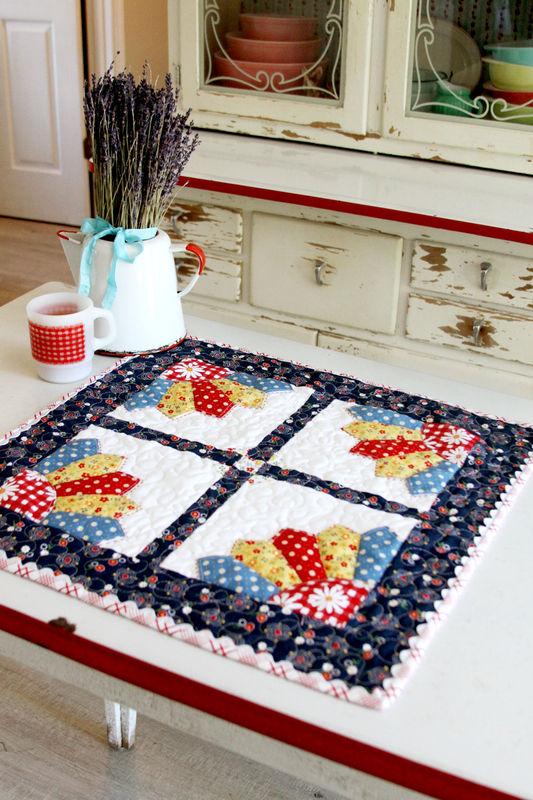 I’m delighted to be featuring this project at tomorrow’s party and pinning too! Lovely cushion. Beautifully made, with very well explained and photographed tutorial. Next I am going to look all around your blog.